The dachshund (UK: /ˈdæksənd/, US: /ˈdɑːkshənd/, German: [ˈdaksˌhʊnt]) is a short-legged, long-bodied dog breed belonging to the hound family. The standard size dachshund was bred to scent, chase, and flush out badgers and other burrow-dwelling animals, while the miniature dachshund was developed to hunt smaller prey such as rabbits. In the American West they have also been used to hunt prairie dogs. The name "dachshund" is of German origin and literally means "badger dog", from Dachs ("badger") and Hund ("dog"). The pronunciation varies widely in English: variations of the first syllable include /ˈdɑːks/, /ˈdæks/, /ˈdæʃ/, and of the second syllable /hʊnt/, /hʊnd/, /ənd/. In German it is pronounced [ˈdakshʊnt]. Because of their long, narrow build, they are often nicknamed hot dog, wiener dog or sausage dog. Although "dachshund" is a German word, in modern German they are more commonly known by the name Dackel; in the case of the formally certified hunting and tracking rank, the name Teckel is used. Dachshunds come in three sizes: standard, miniature, and kaninchen, which means rabbit. Although the standard and miniature sizes are recognized almost universally, the rabbit size is not recognized by clubs in the United States and the United Kingdom, but is recognized by all of the clubs within the Fédération Cynologique Internationale (World Canine Federation) (FCI), which contain kennel clubs from 83 countries all over the world. An increasingly common size for family pets falls between the miniature and the standard size, frequently referred to as "tweenies", and is considered by most breeders to be undesirable. A full-grown standard dachshund averages 15 lb (6.8 kg) to 28 lb (13 kg), while the miniature variety normally weighs less than 11 lb (5.0 kg). The kaninchen weighs 8 lb (3.6 kg) to 10 lb (4.5 kg). According to kennel club standards, the miniature (and kaninchen, where recognized) differs from the full-size only by size and weight, thus offspring from miniature parents must never weigh more than the miniature standard to be considered a miniature as well. While many kennel club size divisions use weight for classification, such as the American Kennel Club, other kennel club standards determine the difference between the miniature and standard by chest circumference; some kennel clubs, such as in Germany, even measure chest circumference in addition to height and weight. Dachshunds have a wide variety of colors and patterns. They can be single-colored, single-colored with spots ("dappled"-called "merle" in other dog breeds), and single-colored with tan points plus any pattern. Dachshunds also come in piebald. The dominant color is red, the most common along with black and tan. Isabella is a silver/gray all over color with light translucent brown points or no distinct points at all. Two-colored dogs can be black, wild boar, chocolate, fawn, with tan "points", or markings over the eyes, ears, paws, and tail, of tan or cream. A two-colored dachshund would be called by its dominant color first followed by the point color, such as "black and tan" or "chocolate and cream". Other patterns include piebald, in which a white pattern is imposed upon the base color or any other pattern, and a lighter "boar" red. The reds range from coppers to deep rusts, with or without somewhat common black hairs peppered along the back, tail, face, and ear edges, lending much character and an almost burnished appearance; this is referred to among breeders and enthusiasts as a "stag" or an "overlay" or "sable". True sable is a dachshund with each single hair banded with three colors: light at the base of the hair, red in the middle, black at the end. An additional, striking coat marking is the brindle pattern. "Brindle" refers to dark stripes over a solid background, usually red; if a dachshund is brindled on a dark coat and has tan points, you will see brindling on the tan points only. Even one single, lone stripe of brindle is brindle. If a dachshund has one single spot of dapple, it is a dapple. Solid black and solid chocolate dachshunds occur and, even though dogs with such coloration are often considered handsome, the colors are nonstandard, that is, the dogs are frowned upon in the conformation ring in the US and Canada. Chocolate is commonly confused with dilute red. Additionally, according to the conformation judges of the Dachshund Club of America (DCA) and the American Kennel Club (AKC) the piebald pattern is nonstandard. However, the piebald dachshund can still be shown; the only disqualifying fault in Dachshunds is knuckling over. While some judges choose to dismiss a dog of color, many choose to judge them and those who are actually judging the dog will look past the cosmetic color of a dog and judge the conformation of the dog first. There were several piebald dachshunds that became AKC Champions in 2008. All things being equal between the dogs in the ring, the traditional colors which are listed in the Official AKC Standard (governed by DCA) should be visibly listed. Light-colored dachshunds can sport amber, light brown, or green eyes; however, kennel club standards state that the darker the eye color, the better. They can also have eyes of two different colors; however, this is only found in dapple and double dapple dachshunds. Dachshunds can have a blue and a brown eye. Blue eyes, partially blue eyes, or a blue eye and a brown eye are called "wall" coloring, and are considered a non-desirable trait in kennel club standards. Dappled eyes are also possible. Dogs that are double-dappled have the merle pattern of a dapple, but with distinct white patches that occur when the dapple gene expresses itself twice in the same are of the coat. The DCA excluded the wording "double-dapple" from the standard in 2007 and now strictly use the wording "dapple" as the double dapple gene is commonly responsible for blindness and deafness. Wall-eye is permissible. Piebald-patterned dachshunds will never have blue in their eyes, unless the dapple pattern is present. They can have a loud bark. Some bark quite a lot and may need training in order to stop. Others will not bark much. Dachshunds are known for their devotion and loyalty to their owners, though they can be standoffish towards strangers. If left alone, many dachshunds will whine until they have companionship. Like many dogs if left alone too frequently, some dachshunds are prone to separation anxiety and may chew objects in the house to relieve stress. They rank 49th in Stanley Coren's Intelligence of Dogs, being of average working and obedience intelligence. According to the American Kennel Club’s breed standards, "the dachshund is clever, lively and courageous to the point of rashness, persevering in above and below ground work, with all the senses well-developed. Any display of shyness is a serious fault." Their temperament and body language give the impression that they do not know or care about their relatively small size. Like many small hunting dogs, they will challenge a larger dog. Indulged dachshunds may become snappy or extremely obstinate. Many dachshunds do not like unfamiliar people, and many will growl or bark at them. Although the dachshund is generally an energetic dog, some are sedate. This dog's behavior is such that it is not the dog for everyone. A bored, untrained dachshund will become destructive. 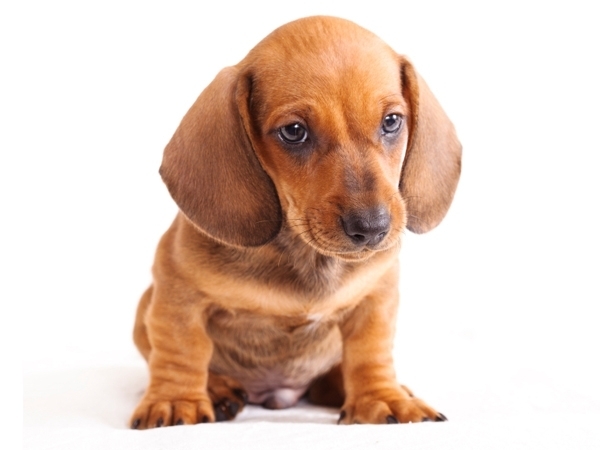 If raised improperly and not socialized at a young age, dachshunds can become aggressive or fearful. They require a caring owner who understands their need for entertainment and exercise. Dachshunds may not be the best pets for small children. Like any dog, dachshunds need a proper introduction at a young age. Well trained Dachshunds and well behaved children usually get along fine. Otherwise, they may be aggressive and bite an unfamiliar child, especially one that moves quickly around them or teases them. However, many Dachshunds are very tolerant and loyal to children within their family, but these children should be mindful of the vulnerability of the breed's back and not carry them around roughly. The breed is known to have spinal problems, especially intervertebral disk disease (IVDD), due in part to an extremely long spinal column and short rib cage. The risk of injury may be worsened by obesity, jumping, rough handling, or intense exercise, which place greater strain on the vertebrae. A new minimally invasive procedure called "percutaneous laser disk ablation" has been developed at the Oklahoma State University Veterinary Hospital. Originally, the procedure was used in clinical trials only on dachshunds that had suffered previous back incidents. Since dachshunds are prone to back issues, the goal is to expand this treatment to dogs in a normal population. In some double dapples, there are varying degrees of vision and hearing loss, including reduced or absent eyes. Not all double dapples have problems with their eyes and/or ears, which may include degrees of hearing loss, full deafness, malformed ears, congenital eye defects, reduced or absent eyes, partial or full blindness, or varying degrees of both vision and hearing problems; but heightened problems can occur due to the genetic process in which two dapple genes cross, particularly in certain breeding lines. Dapple genes, which are dominant genes, are considered "dilution" genes, meaning whatever color the dog would have originally carried is lightened, or diluted, randomly; two dominant "dilution" genes can cancel each other out, or "cross", removing all color and producing a white recessive gene, essentially a white mutation. When this happens genetically within the eyes or ears, this white mutation can be lethal to their development, causing hearing or vision problems. Other dachshund health problems include hereditary epilepsy, granulomatous meningoencephalitis, dental issues, Cushing's syndrome, thyroid problems, various allergies and atopies, and various eye conditions including cataracts, glaucoma, progressive retinal atrophy, corneal ulcers, nonucerative corneal disease, sudden acquired retinal degeneration, and cherry eye. Dachshunds are also 2.5 times more likely than other breeds of dogs to develop patent ductus arteriosus, a congenital heart defect. Dilute color dogs (Blue, Isabella, and Cream) are very susceptible to Color Dilution Alopecia, a skin disorder that can result in hair loss and extreme sensitivity to sun. Since the occurrence and severity of these health problems is largely hereditary, breeders are working to eliminate these. Old-style dachshund showing the longer legs. The first verifiable references to the dachshund, originally named the "Dachs Kriecher" ("badger crawler") or "Dachs Krieger" ("badger warrior"), came from books written in the early 18th century. Prior to that, there exist references to "badger dogs" and "hole dogs", but these likely refer to purposes rather than to specific breeds. The original German dachshunds were larger than the modern full-size variety, weighing between 30 and 40 lb (14 and 18 kg), and originally came in straight-legged and crook-legged varieties (the modern dachshund is descended from the latter). Though the breed is famous for its use in exterminating badgers and badger-baiting, dachshunds were also commonly used for rabbit and fox hunting, for locating wounded deer, and in packs were known to hunt game as large as wild boar and as fierce as the wolverine. The flap-down ears and famous curved tail of the dachshund have deliberately been bred into the dog. In the case of the ears, this is so that grass seeds, dirt, and other matter do not enter the ear canal. The curved tail is dual-purposed: to be seen more easily in long grass and, in the case of burrowing dachshunds, to help haul the dog out if it becomes stuck in a burrow. The smooth-haired dachshund, the oldest style, may be a cross between the German Shorthaired Pointer, a Pinscher, and a Bracke (a type of bloodhound), or to have been produced by crossing a short Bruno Jura Hound with a pinscher. Others believe it was a cross from a miniature French pointer and a pinscher; others claim that is was developed from the St. Hubert Hound, also a bloodhound, in the 18th century, and still others believe that they were descended from Basset Hounds, based upon their scent abilities and general appearance. The exact origins of the dachshund, then, are unknown. According to William Loeffler, from The American Book of the Dog (1891), in the chapter on Dachshunds:"The origin of the Dachshund is in doubt, our best authorities disagreeing as to the beginning of the breed." What can be agreed on, however, is that the short-haired dachshund gave rise to both the long-haired and the wire-haired varieties. There are two theories regarding how the standard longhair dachshund came about. One theory is that smooth Dachshunds would occasionally produce puppies which had slightly longer hair than their parents. By selectively breeding these animals, breeders eventually produced a dog which consistently produced longhair offspring, and the longhair dachshund was born. Another theory is that the standard longhair dachshund was developed by breeding smooth dachshunds with various land and water spaniels. The long-haired dachshund may be a cross among any of the small dog breeds in the spaniel group, including the German Stoberhund, and the smooth-haired dachshund. The wire-haired dachshund, the last to develop, was created in late 19th century. There is a possibility the wire-haired dachshund was a cross between the smooth dachshund and various hard-coated terriers and wire-haired pinschers, such as the Schnauzer, the Dandie Dinmont Terrier, the German Wirehaired Pointer, or perhaps the Scottish Terrier. Dachshunds have traditionally been viewed as a symbol of Germany. Political cartoonists commonly used the image of the dachshund to ridicule Germany. During World War I the dachshunds' popularity in the United States plummeted because of this association and there are even anecdotes such as a Dachshund being stoned to death on the high street of Berkhamsted, England at this time because of its association with the enemy. As a result they were often called "liberty hounds" by their owners similar to "liberty cabbage" becoming a term for sauerkraut. The stigma of the association was revived to a lesser extent during World War II, though it was comparatively short-lived. Kaiser Wilhelm II and German Field Marshal Erwin Rommel were known for keeping dachshunds. In Germany, dachshunds are widely called Dackel (both singular and plural). To be classified as a full Teckel, these dogs must undergo blood tracking tests. Classically, any dog of Dackel heritage is given an official tattoo upon one ear. After suitable training, the dog must then follow a blood trail that is at least 48 hours old successfully to its conclusion. Once this is completed, another tattoo is marked on the other ear to denote full Teckel rank. Teckel, whether tattooed or not, are bred for hunting purposes, and they tend to be visibly larger in their chests than their Dackel counterparts, though marginally shorter in length. Dachshunds are one of the most popular pets in the United States, ranking seventh in the 2008 AKC registration statistics. They are popular with urban and apartment dwellers, ranking among the top ten most popular breeds in 76 of 190 major US cities surveyed by the AKC. One will find varying degrees of organized local dachshund clubs in most major American cities, including New York, New Orleans, Los Angeles, and Chicago. The breed is popular in Europe, America and Japan.